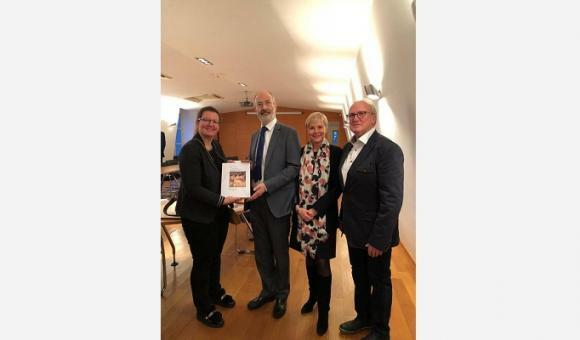 On 22 January, the representatives of 11 European spa towns, including Spa, were at the Czech Embassy in Paris for the inscription of the “Great Spas of Europe” dossier on the UNESCO World Heritage List. The Belgian Ambassador to UNESCO and the OECD, Jean-Joël Schittecatte, the Mayor of Spa, Sophie Delettre, the General Delegate of the Wallonia-Brussels Federation and Wallonia in France, Fabienne Reuter, and the alderman Paul Mathy attended the ceremony held to sign the letter formalising the proposal for inclusion. The nomination gathers a selection of spa towns which illustrate the evolution of medicine through locations dedicated to mineral and spa treatments. These spa towns are also known for their unique architecture composed of thermal baths, colonnades, churches, theatres, casinos and hotels. The Ambassadors of Germany, Austria, Belgian, France, Italy, the Czech Republic and the United Kingdom signed the “Great Spas of Europe” nomination letter. This is an essential stage in the dossier's submission to the World Heritage Centre. The final decision as to inscription on the UNESCO World Heritage List will be taken by the World Heritage Committee.